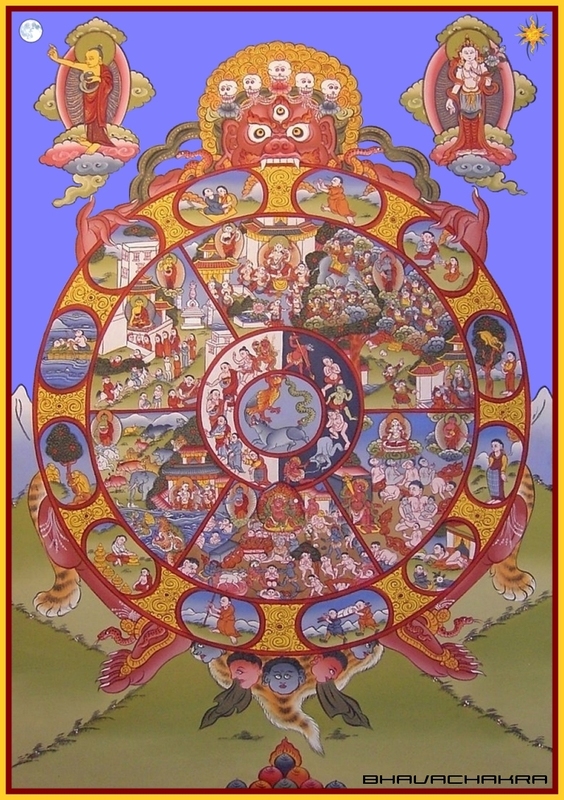 In Buddhism, Hinduism, and Jainism, the Bhavachakra (The Wheel Of Life - or Existence, or Becoming) is a symbolic representation of Samsara - the continuous cycle of birth, life, and death; and Paticca Samuppada (Dependent Origination, aka Conditioned Arising, or Causal Nexus) with its principle of causality - the law of cause and effect, of actions and consequences. Both refer to the idea that as long as we remain ignorant, clinging, and hateful, we will create Karma, and continue to be reborn into this world full of suffering and pain. A being is liberated from this endless cycle when Enlightenment is achieved, and the Awakened individual reaches Nirvana (or Moksha, or Samadhi) - the highest state of bliss that has long been a part of the Vedic tradition, continuing into Buddhism with Gautama Buddha, and Jainism with Mahavira, as Liberation is the central goal of all Dharmic philosophies. Realized from Buddha's visions, the esoteric and contrasting imagery of The Wheel of Life, with each aspect of its four concentric circles packed with rich symbolism and direct, hard-hitting metaphors, became the inspiration for my next project. I decided to concentrate on ambient, atmospheric, cinematic, and/or textural types of arrangements by adding modern instrumentation to loops and samples with traditional Asian and/or Indian influences. Given the number of compositions needed for conceptual purposes, I also decided to restrict myself to one compact disc by including some miniatures. Although most of the arrangements are sedate when compared to my other projects, the music is not meant to be listened to as "background noise" or act as a meditative device by masking or cleansing all thoughts and feelings, but to immerse the listener in a collection of exotic soundscapes and evoke as many emotions and memories as possible. Within the hub, there are animals that symbolize The Three Poisons (aka The Three Fires) - a pig for Delusion (or Ignorance), a rooster for Greed (or Lust), and a snake for Hatred (or Anger). The trio is depicted as biting each other's tails, linking in such a way as to form a circle, showing how they are inseperably connected and fundamental to sustaining Samsaric existence. It is appropriate that these forces are depicted by animals, since they represent primitive urges beneath our human exterior. This arrangement features electric guitars playing rhythm, melody, harmony, and lead in a foreboding mood over a complex synth bed. The intermediate state between Death and Rebirth is depicted as a half-white, half-black circle. The Bardo Beings are shown in the forms they will take in their next realm. The white half symbolizes beings ascending to the higher realms, and viceversa. The culmination of experiences in the Sidpa Bardo is the Scene of Judgment, during which Yama Raja (Lord Of Death) examines the past actions of an individual from a karmic point of view, and then assigns that being to one of the six realms of Samsara according to their merits, or lack thereof. Ambient acoustic piano themes in free time over a drifting synth progression, alluding to the rising and falling of the Beings. A Bodhisattva is depicted in each of the six realms, as well as outside the Bhavachakra, suggesting that compassionate beings are everywhere to help those in need. Bodhisattvas are beings whose Buddhahood is assured, but postpone their own entry into Nirvana to help all other sentient beings attain it first. The Buddha himself was described as one in stories of his previous lives. Life in this realm contains continual pleasure and happiness, although it is not everlasting. Once a god's karmic forces have been used up, they are destined to rebirth in a lower realm. The gods are shown partaking of similar sensuous experiences as humans, like playing music, although at a rarefied level. The point being that gods are not so far removed from the human realm, and even mortals can become gods by following the Noble Eightfold Path. This arrangement features dynamic interplay between a hammered dulcimer (panned left), an erhu - a two-stringed Chinese spike fiddle (center), and a pipa - a Chinese lute (right). This realm is populated by demigods who should be as happy as the gods, but their minds are clouded by jealousy and anger over the Devas' better fortunes. A Wish-Fulfilling Tree grows from their realm to that of the Devas, but they are unable to get a hold of the fruit. This causes them to wage war, where they are always defeated. Although living in a heavenly realm, their lives are full of suffering, quarrels, fighting, and violence. Guitar, tabla set, cymbals, ambient percussion, synth, and voices combine in an arrangement that includes a lot of tension and resolution, meant to symbolize the "celestial hell" atmosphere of this realm. The pathetic beings in this realm endure a life full of perpetual hunger, unquenchable thirst, extreme heat and cold, fatigue, and fear. Illustrated with a mouth the size of a needle's eye, a throat as narrow as a hair on a horse's tail, limbs as thin as grass stalks, and a stomach as vast as a mountain, their minds and bodies suffer continually until death. Guitar and effected piano themes over a bed of synth vox, pads, and drones. A lifetime of indescribable torment and relentless pain awaits the denizens of this realm. It has been written that the greatest suffering in the human realm cannot serve even as a remote example of the slightest agony in this one. With limited opportunities for good actions, it is very difficult to escape. Tradition has it that a life here may extend over many aeons, perhaps corresponding to the well-known human experience of "time dragging on" when we are suffering. A miniature composition featuring a solo overdriven guitar played with an E-Bow. This realm is dominated by instinct and a need for survival, making opportunities for moral actions very limited. In addition, animals who are ownerless are subject to being killed by entities from other realms for their flesh, fur, etc., while animals with owners are subject to being enslaved, employed, bound, beaten, and even slaughtered. This realm is a representation of the ignorance of humans to see beyond the needs of their bodies. 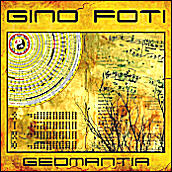 Flute themes over complex synth beds and miscellaneous percussion. Obviously where we currently reside. Containing a balance of pleasure and pain, Buddhism regards this as the best realm to be born into, as it offers the best conditions to practice the Dharma, attain Enlightenment, and liberate oneself from Samsaric existence. This arrangement features the chanting of "The Prayer for Harmony and Peace", accompanied by arpeggiated guitar, effected flute, and a drifting synth bed. The blind man symbolizes primordial Ignorance - he cannot see the Dharma, and is unknowing of the Four Noble Truths. With lack of insight, he staggers and falls over and over, each time dragging himself to his feet with renewed hope. Chinese temple flute themes over a drifting synth bed and drones. A potter molding a pot, illustrating Activity, brings about Karmic Formations. We shape our own destiny with our actions: good, bad, or neutral, as they each have the latent power within them to bear fruit in the future. Keyboard themes over a complex synth bed, drone, and assorted percussion including: Tibetan singing bowls, Tibetan bells, and bar chimes. A monkey leaping from one tree to another symbolizes Consciousness. It lacks self-control as it moves from one object to another aimlessly, remaining unfulfilled and devoid of any sense of achievement. Acoustic piano themes in free time over drifting synth pads. Three men in a boat as Name and Form (or Mind and Body) traveling on the river of Samsaric life. Each individual is made up of a Mind and a Body, represented by each of the two smaller men. The larger one steering the boat is the Name-Form composite which makes up the complete individual each of us is, usually described as the Psychophysical Organism. Without its counterpart, the Body or the Mind is incomplete and insufficient. This arrangement features a banhu (or banghu - a Chinese spike fiddle) playing various themes over a bed of ambient percussion, "Aum" chant, and effected flute. A house with six windows symbolizes the Six Senses (Buddhism regards the Mind as a sense sphere) which let in all our impressions of the world, just like windows let sunlight enter into a house. This composition is centered around sitar and flute solos accompanied by tabla set, rhythm guitar, synth bed, and female voice. A couple embracing and making love defines intimate Contact between world and mind-body, between the senses and their objects, wherein lies their ultimate fulfillment. Solo acoustic piano themes in free time. A man with an arrow through the eye illustrates Feelings, some that are so strong that they blind us to the truth. According to Buddhist psychology, the experience of direct pain is confined to a relatively small area of the total possibilities of conscious experience. Unfortunately for us, this is the area in which we habitually dwell. A miniature composition featuring Asian flute themes over a drifting synth bed of vox and drones. the builder of this house. Sorrowful is it to be born again and again. O house-builder! Thou art seen. NB: house = "body"; rafters = "passions"; ridge pole = "ignorance"
A woman offering a man a drink shows how feelings lead to Cravings. Here, the promise of satisfaction leads only to intoxication and addiction to pleasure. This arrangement features jazz fusion-styled electric guitar themes accompanied by synth beds, vox, and effected percussion. A monkey grasping fruits illustrates how desire leads us to cling to destructive behaviors, away from the Dharma. Fruit is an ancient symbol of earthly desires, making this a logical development from the previous link. Craving leads to direct action to obtain the objects of our desire. This arrangement is centered around a keyboard solo over a bed of several instruments, including: rhythm guitar, sabahar (bass sitar) drones, ghatam (Indian clay pot), hi-hat, and synth pads. Also includes sections with guitar themes, veena (or vina - an ancient stringed instrument), tampura (drone lute), and a coda with vocals in the Carnatic tradition, the classical music of Southern India. A pregnant woman as Becoming (or Existence) -- a new being resides in the womb. Acoustic piano themes in free time over an atmospheric synth bed. A woman gives Birth (or Rebirth) into the human realm. This also depicts the appearance of the Five Aggregates: Material Form, Feeling, Perception, Formation, and Consciousness from the womb. Two men carrying a corpse illustrates Decay, which results in Death, to be followed by endless rounds of birth, life, and death within Samsaric existence. A meandering composition containing ambient synth themes, drones and pads, various percussion instruments, ending with some keyboard histrionics that signify the inevitable. Yama, the wrathful aspect of Chenrazee (national protector of Tibet), holds the Bhavachakra, which should be visualized with all the concentric circles constantly turning, with his mouth and hands. This reminder of Impermanence is meant to symbolize that there is not a single being in Samsaric existence who is outside the control of Death. Dissonant chords over a bed of synth vox and drones are joined by a Buddhist temple bell that tolls once for every realm and link in the Wheel. Having achieved Enlightenment, all Buddhas are outside Samsara. He is shown pointing to the moon, symbolizing the attainment of Nirvana, or Liberation - that cool and peaceful state of mind free from all delusions and suffering. Synth introduction with Buddhist chanting transitions to an acoustic piano composition that features Asian themes performed in a classical theme-and-variations style, with tempo changes and free time sections.